We read with great interest the article by Bennet et al 1 that investigated the impact of dietary shifts on gut microbiota. Together with several recent studies,2–5 they have shown that short-term dietary shifts can alter the composition of gut microbiota for both patients and healthy humans. However, these works drawn the conclusion with only a few time points and the subjects under investigation had undergone just one dietary shift. The dynamic patterns of microbial communities across longer time scales with multiple dietary shifts remain unclear. Interestingly, we found that gut microbial communities are bidirectionally plastic and resilient across the long stay with multiple dietary shifts. First of all, BJN and TTN exhibited different patterns of microbial communities (figure 1A). The microbial communities of VT members, however, shifted from those similar to BJN towards TTN pattern accompanying their stays in TAT, and reverted to their original patterns within 1 month after VT returned to Beijing (figure 1B–F). Such plastic pattern is also verified by DeBlur7 analysis. Besides, though we have found that locations and populations have strong effects on differentiation of samples (figure 1G,H), the dynamic changes for each member of VT showed specific trends (figure 1I,J), indicating the possible enterotypes-dependent plastic patterns among VT members. Additionally, the relative abundances of phylum Firmicutes and Bacteroidetes have shown a strong resilience along the timeline, and they are negatively correlated along the timeline (figure 1K,L). Similarly, the relative abundance of Proteobacteria and Actinobacteria also exhibited plastic patterns (figure 1M,N). By tracing and comparing the common operational taxonomic units (OTUs) shared by at least 10% of VT members, we found that individual OTUs within Firmicutes, Bacteroidetes, Proteobacteria and Actinobacteria have distinctive temporal dynamics during VT’s long stay (figure 1O–R). Pattern of human gut microbial community during the long stay with multiple dietary shifts. 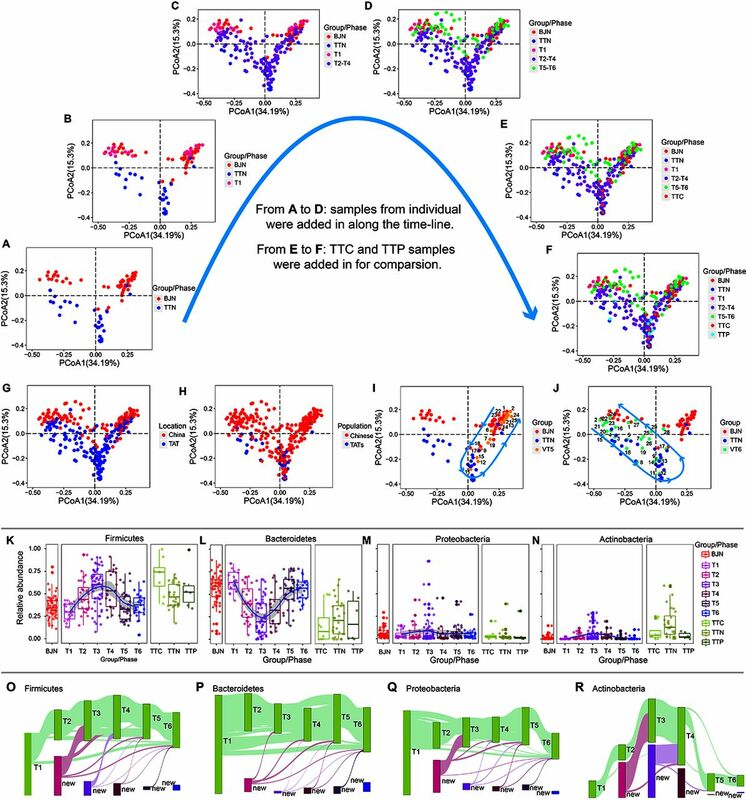 The dynamics of human gut microbial communities are shown through comparing different groups/phases of samples, including (A) BJN and TTN groups, (B) BJN, TTN and T1 groups, (C) BJN, TTN, T1 and T2-T4 groups, (D) BJN, TTN, T1, T2-T4 and T5-T6 groups, (E) BJN, TTN, T1, T2-T4, T5-T6 and TTC groups, (F) BJN, TTN, T1, T2-T4, T5-T6, TTC and TTP groups. The large arrows indicate the progressive add-in of groups for comparison. The profile of all faecal samples labelled by (G) collected locations, and (H) populations (Chinese or TATs). In (H), the label ’Chinese' represents all samples from BJN, VT and TTC, while the label ’TATs' represents all samples from TTN and TTP. The dynamic changes of gut microbiota for two members of the VT, including (I) VT5, and (J) VT6. The curves with arrows in (I) and (J) represent the directions of changes of microbial communities. Panels (K), (L), (M) and (N) show the dynamics of the average relative abundance of Firmicutes, Bacteroidetes, Proteobacteria and Actinobacteria along the temporal axis. Results were visualised using PCoA of weighted UniFrac distances of 16S rRNA amplicon profiles. OTUs shared by at least 10% VT samples during same phase (green bars) are tracked using Sankey plots for (O) Firmicutes, (P) Bacteroidetes, (Q) Proteobacteria and (R) Actinobacteria. The heights of bars are proportional to the number of OTUs, and phases are arranged in chronological order. The lines represent the transfer of OTUs between phases and are coloured according to the first phase of their appearance. The abbreviations used in this figure are listed as follows: BJN, Beijing natives; OTUs, operational taxonomic units; PCoA, principal coordinates analysis; TTN, Trinidad and Tobago natives; T1-T6, six phases; TTC, Trinidad and Tobago Chinese; TTP, Trinidad and Tobago patient; VT, volunteer team. The bi-directional plasticity of human microbial community was largely mediated by dietary shifts. During their stay in TAT, VT members consumed local foods (online supplementary table 1) mainly including fish and seafood, dairy products, and refined grains, which were considerably different from those in Beijing (online supplementary table 2). Significant correlation was observed between dietary shifts and the dynamics of gut microbial community structures (p<0.05, Mantel’s test, online supplementary table 3 and 4). We thank Yumin Song and all other members of Embassy of the People’s Republic of China in the Republic of Trinidad and Tobago, for their support in sample collection for this work. We thank Le Cao and Chaofang Zhong, from College of Life Science and Technology, Huazhong University of Science and Technology, Wuhan, China, for their help in preparing the figures. HL, MH and SCL contributed equally. Contributors This study was designed by HL, JW, DBB and KN. MZH, HL, RW, YWL, ZQH, FC, JJP, HP, QZ, LQC, HXS, FG and YX collected samples. MZH, HL, RW and PSY analyzed the data. MZH, HL, SWS, SCL, GMT, DBB and KN wrote the initial draft of the manuscript. All authors revised the manuscript. Funding This work was partially supported by National KeyResearch and Development Program of China (2018YFC0910502 and 2018YFC0910405), NationalNatural Science Foundation of China (31671374, 31871334, 31327901, 31671369,31770775, 61521092, 91430218, 61472395, and 61432018), Ministry of Science andTechnology’s high-tech (863) grants (2014AA021502, 2016YFB0201305,2016YFB0200803 and 2016YFB0200300), and the GRF Research Project 9042348(CityU11257316).